Looking to add a bit of life to those retro tracks? Though the instruments lack legato and are a bit heavy on the baked-in vibrato, Vintage Vocals has a nice selection of timbres to transport you to the time of Funk, Soul and R&B. Vintage Vocals downloads as 2.12GB. It is a samples set of female vocalists emulating the background vocal styles of the 60s/70s. For the instrument, Funk /Soul sampled three different singers: Angela, Janice & Tiffany. All sound really nice with my favorite from the first look being the timbres of the Tiffany instrument. The Kontakt instrument includes articulations for playback of Oohs, Ahs, and Ohs, Sustains, Staccatos and Swells. Although I found the baked in vibrato a little heavy at the time I think using my ears and careful placement as background. The ensemble patches come as Unison, Major & Minor Chords. 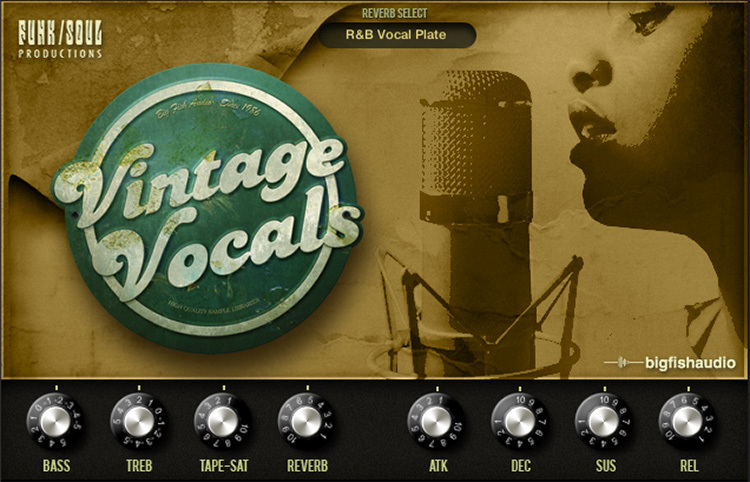 Vintage Vocals is a Kontakt Player Instrument and loads right into your libraries tab. It is compatible with both the full and free version of Kontakt 5.7.1+.